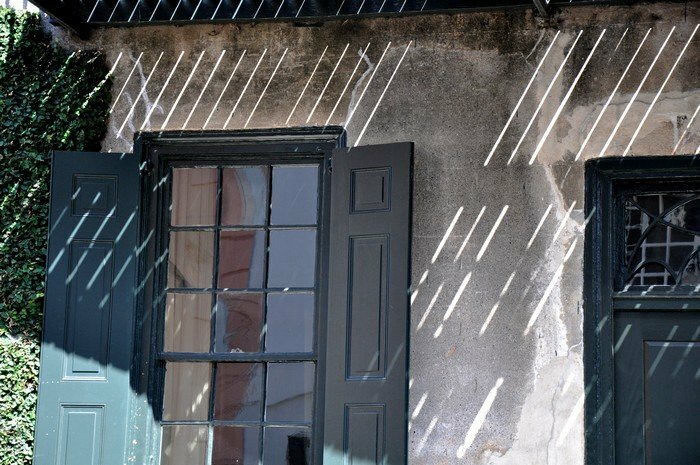 Walking the streets of Charleston, South Carolina on a Saturday afternoon - lots of nice shadows but these were "lines"! Perfect for the theme! Indeed, perfect cast of shadows, I like the colors. I love the lines. I think pictures of shadows or patters from shadows are so different. Great capture! Lines of shadows are nice to look at and of course they work for the theme. such great shadows for the theme, what a nice picture, love it! Beautiful shot - for both the theme and just a pretty photo! Very good for the theme - you are really keeping your eyes open for those lines! Great shot Suzie - almost looks like a painting - so cool. Awesome picture Suzie. It really does look like a painting. The sun streamers are great, but I would love to see it in the shade too. Very pretty. Beautiful. The framing and pont of view make it a very special picture. This is a brilliant photo with a surreal feel to it and perfect for the theme. Very cool shadows and lines. Beautiful capture. Nice observation for a great picture. Hi Suzie, good to be back,I wont be on here too much either this time,haha. This is such a gorgeous shot,what a cute building and great lines for the theme! I like the composition, the strong geometry! Great eye! Hey Suzie, so very creative, love it. My son use to live in S. Caroline. I'm sorry, but you all can keep your aligators. Couldnt believe they had one in their lake in the back yard. Yikes. The "Holy City" has much to offer that is a pleasure to the eyes. Lovely shot, theme or no theme. This is beautiful! Great theme shot too!